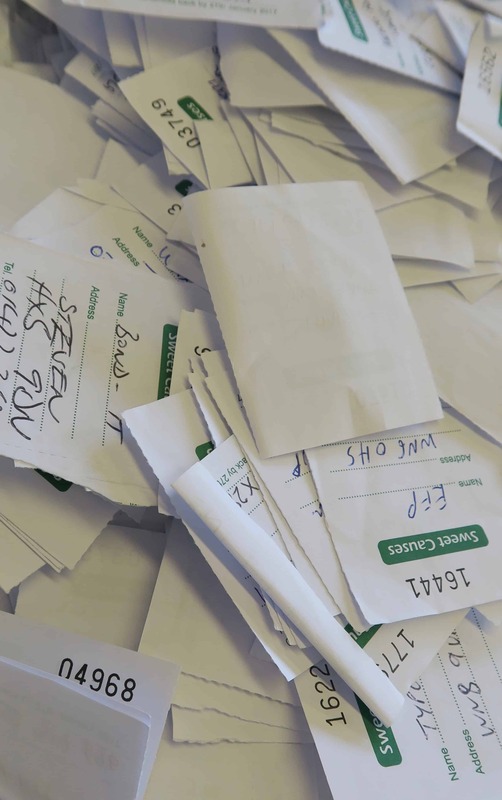 And the winners are …. 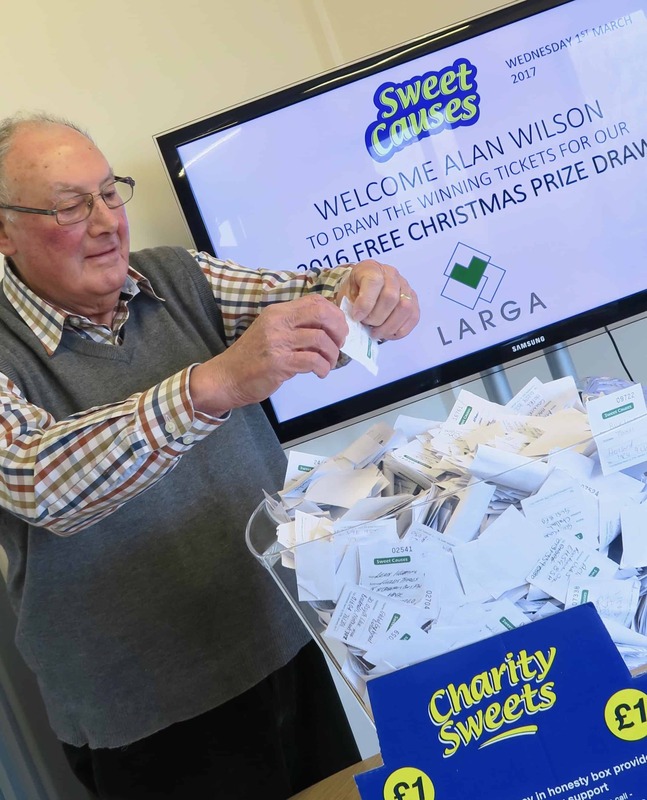 FREE CHRISTMAS PRIZE DRAW 2016/2017 – Charity Sweets by Sweet causes Ltd. Forget this years Oscars, we have our own winners here! 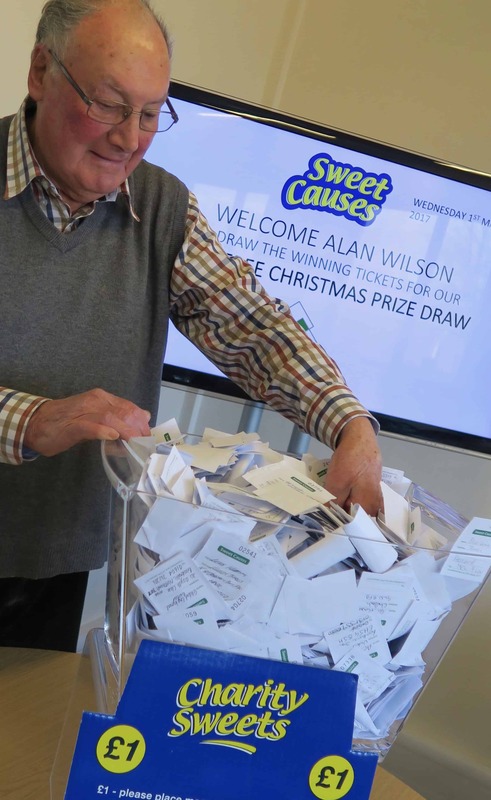 The ‘Free Christmas Draw’ tickets have all been handed in, there was a slight delay due to sickness or holidays, we wanted to make it fair for everyone by getting every ticket into the office before the final draw took place, so we apologise to those of you who have been eagerly waiting, thank you for being so patient. 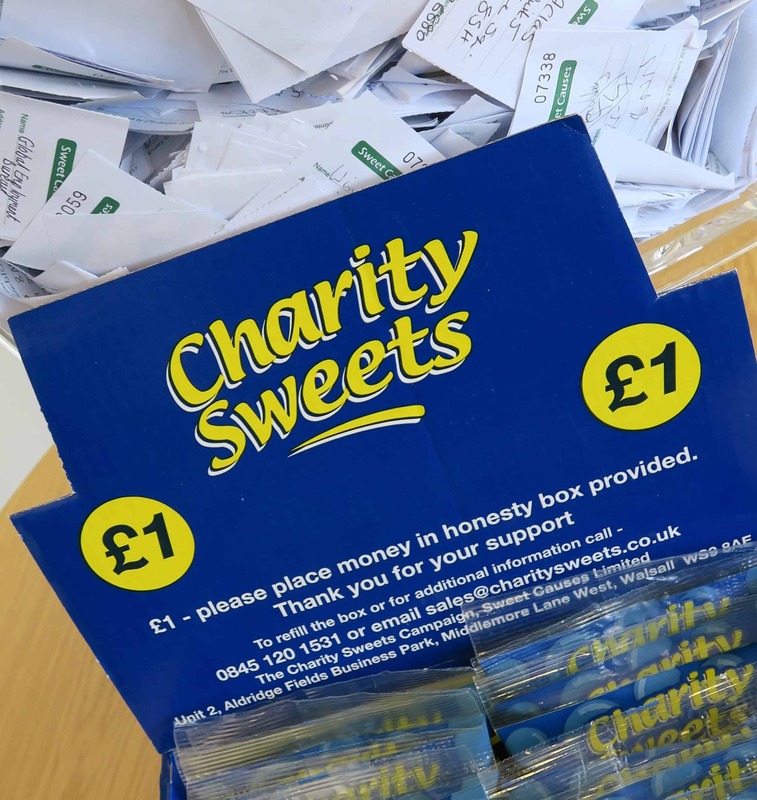 We have had a tremendous amount of interest this year with thousands taking part, a big thank you to all who participated by supporting some of our worthy causes, we just about managed to get all the tickets in the tub this year. Kindly helping us out with the draw was Mr Alan Wilson from LARGA – Little Aston Recreation Ground Association. 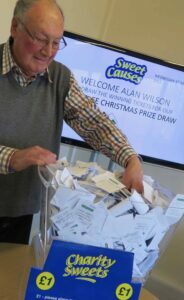 Alan who has recently stepped down as Chairman but still remains on this committee, who by the way, have from the outset raised a fantastic amount of money, each and every year all of the profits go to the Little Aston Recreation Ground Association. Their promise has always been ‘it was raised by the community, for the community and so the proceeds should go to the community’. Their main fund raising event, which takes place by hosting a wonderful open air live music festival on the community grounds itself, each Summer for all the family, it has that kind of Glastonbury vibe feel about it, so much so, it has now adopted the name ‘Little Astonbury’ by the local people. 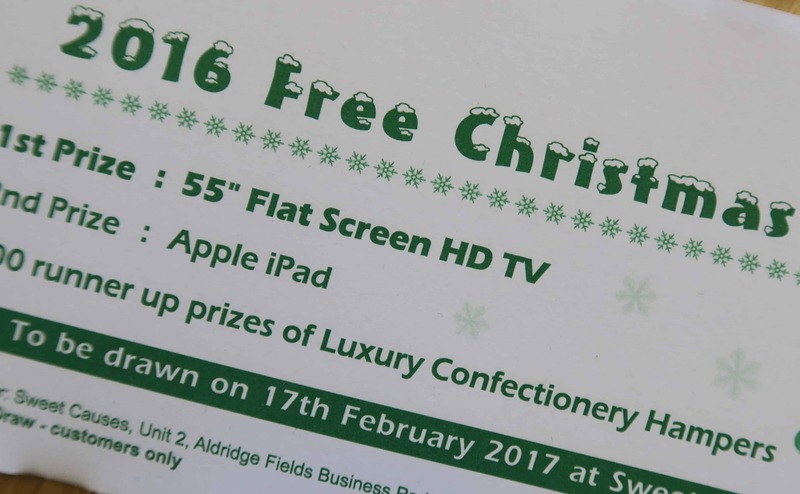 This year’s event will take place on Saturday 15th July 2017, tickets go very, very quickly and last year there was a waiting list of well over 800 people wanting and pleading for cancellations or spare tickets on Facebook and other social media sites, so you better be fast as they go like hot cakes. 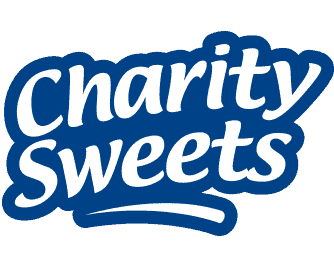 We ourselves will be on hand sponsoring and supporting such a well-deserved event by donating some of our sweets. Amco 23166, Amfin 24295, AMPL Ontrade Ltd 18500, Andrew Plastics 16222, B&M Care 28501, Bobbi Ross Hair 13600, Bond – It 18469, BPS 24005, Bradford Engineering Services Ltd 18029, Brendon Avenue Surgery 24028, Bronte Water LTD 18462, BT Open Reach 01450, Burbank Community 26527, Burroughs 16769, Busy Bees Nursery 21319, CAD Shelters 16223, Campbell Sievewright homes 18599, Car Detailing & Finishing Specialists 16774, Carpetright 26509, Carston Accountants 16775, CAS 07622, Chapel Windows 15001, Charles Howell Estate Agents 09961, Charlestown Motor Repairs 06582, Coalport 23127, Coatham Primary 26741, Community Library 08957, Complete Care Agency 23070, Cotswold Oudoor Centre 08792, DJR Smith Ltd 26599, Easby Electrical 25064, ECARS 16773, ESA Systems 16776, Evesham Fire Station 09675, Flushdyke Kennels 21146, Grange Products 06521, Haddon Training Ltd 17684, Hair By Jason 18481, Holden Aluminium 09982, Hughes Bro’s 27049, Icon 08877, Innovations 09674, Jacs Ltd 17644, Jewson 21315, Jonathan Randall 09000, Juliana’s 18542 , Keltruck 16771, Kentintrol 18013, Land Tax 17508, Laser 24 29643, Lowestoft Car Hire 05757, Lowestoft Tile Centre 05761, M& B Motors 17589, Marske Fabrication 26505, Matrix Wiring LTD 05600, MD Carpentry 09963, Menzies Distribution 05617, Miah Solictitors 23043, Norwich Sunblinds 05561, Ovamill Ltd 05760, Owton Community 26753, Plumbase 21035, Quantum 017641, Randells 05702, RBS 20621, Ruggles & Jeffery 29642, Rye Hills School 26507, Salcomotive Services 09962, Sams K9’s 24139, Schnider Electric 24443, Scruples 25556, Seal Glass 08959, Sealite 05763, Sealite 05762, Sensory 06523, Servatool Co Ltd 08665, Skegness Infant School 01224, Skegness Junior School 01221, Speedy Asset Services 25153, Stockport Grammer School 06501, Swarco Traffic Ltd 25070, Tayport Arms 23212, Tennables 17685, The Barber Shop 26508, The CBS Group 03987, The Hair Studio 01240, The Hairlounge 26541, The Sleep Shop 01421, Thyssenkrupp 06774, Tile With Style 21320, Toby Carvery 21072, Travis Design 01440, Turning 23126, Tyre Shop 05040, Urban Edge 16280, ValleyOaks 08958, Vauxhall Bayliss 09662, Vellacine 16770, WF Senate 16772, Wilcan 03799.